Jess's Many Mini Adventures in Food and Farming: Raw Milk, Yogurt, Viili, oh my! Raw Milk, Yogurt, Viili, oh my! My God, I love Mr. Harold McGee. I saw him once in one of my favorite Google cafeterias, sampling yogurt. I didn't have my copy of On Food and Cooking on hand, so I couldn't ask for a little piece of his genuis, but I did watch him as he went over and took a little cup of creamy deliciousness for himself. Rumor has it (direct from the head chef of that particular cafe) that McGee himself provided the starter, originally from a friend of his from India, for the delicious, perfectly textured & flavored goodness that we were served each morning. Colin and I tried our own yogurt experiment last weekend. We started with one quart of Heritage Farm's oh-so-good raw (whole) milk; or rather, a little less than a quart after we each sneaked a little sip, which we heated to 200 F, stirring constantly so a skin didn't form. I think this was probably a little hot -- 175 or 180 is really more like it. 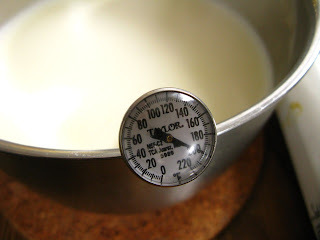 Then we waited for it to cool to 135 F and stirred in 2 tbsp of Brown Cow Cream Top yogurt. Then it was time to wait. We swaddled our yogurt baby in a warm cloth and rubber banded some paper towels over the top and left it under a grow light in the bunkhouse, next to the tomato starts. 16 hours later, we divvied up the results into our respective refrigerators. "bind to the water and one another and make the whey less runny, thicker and more clingy. EPS producers are the bacteria that dominate in Finnish viili, which is so clingy that you can stretch it a foot or more between bowl and lifted spoon. You eat viili by cutting it into pieces." You couldn't cut our yogurt to pieces, but it did have a certain stringiness and chewiness that I've never experienced in yogurt (in anything?). I think we inadvertently stumbled on Nordic fermented milk (viili). No mistake, the flavor was awesome, and I totally respect the Finns, but I would consider using regular pasteurized milk next time and maybe take McGee's advice on using typical sweetened, non-organic, no-frills yogurt for starter. About 5 years ago there was this huge homemade yogurt craze in Japan. My mom smuggled some back from my aunt's house but sadly was only able to replicate the taste once. I'm going back in the winter, will try to smuggle some once more for you. It's glorious. Yay! You must smuggle me some. I can't wait. Homemade yogurt is yuuuuuum. I'm going to make a new batch today.